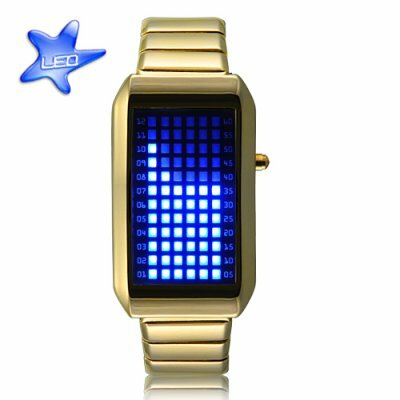 Successfully Added Zero Kelvin Gold - Japanese Style Inspired LED Watch to your Shopping Cart. Say hello to the Zero Kelvin Gold, a blue LED watch from the future which articulates the essence of cool by revolutionizing how we tell time. You mean this watch really tells the time? Yes. Even though The Zero Kelvin Gold embodies apex style and vanguard design with its mesmerizing blue LEDs encased in carbonate hues (like magnetized pulsars in an swirling ocean of black matter), this blue LED watch does in fact tell the time and does so really efficiently too! Why is this watch called The Zero Kelvin Gold? The Zero Kelvin part because it's absolute cool. Not absolutely cool but absolute cool. See you can break grammatical rules when you're this cool. Oh and the gold part is a reference to the Robert Frost poem and especially The Outsiders where Johnny tells Ponyboy STAY GOLD! This is a nice casual watch. The LEDs are so bright that you can use it to illuminate at night instead of using a flashlight. Would be better if the MOQ is not applied.